Johannes Kepler was born December 27th, 1571 in a small town of Weil der Stadt in Swavia (Holy Roman Empire, now Germany). He grew up living with his mother (who was later accused of witchcraft) in his grandfathers inn. He first attended a local school and then a nearby seminary and later enrolled at the University of Tübingen. He was very religious and often referred to god in his work as a fulfillment of his Christian duty to understand the works of God. He believed that man were created in Gods image and was fully capable of understanding Gods universe which according to him was made according to a mathematical plan. Kepler often thanked God for giving him insights. At University, Kepler studies geometry, arithmatic, music, and (geocentric) astronomy which was taught by Michael Maestlin. After graduating he was offered to teach at the Lutheran school in Graz, Austria which he left because of mandatory shift to Roman Catholicism. In the late 1500’s, while seeking another job he met Tycho Brahe, a Danish astronomer who recorded the movements of each planet and several hundred stars. Kepler became Brahe’s much needed assistant and when Brahe died in 1601 Kepler was appointed by Rudolf II, the wholly Roman Emperor to continue Brahe’s work as imperial mathematician. Kepler is most famous for discovering three laws of planetary motion which were later use by Newton to arrive at the principle of universal gravitation. 1. Planets revolve around the sun in elliptical orbits. 2. Planets move more and more rapidly as their orbits approach the sun. 3. The time taken by a planet to orbit the sun varies proportionally with its’ distance from the sun. These laws proved Copernicus’s heliocentric theory. calculating the most exact astronomical tables. 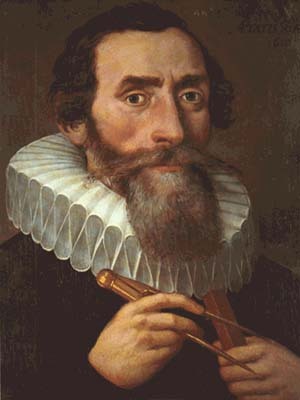 After a short illness, Kepler died in Regensburg on November 15th, 1630. He was buried in a local church which was destroyed during the Thirty Years’ War.